USA Hockey on Wednesday announced the players scheduled to participate in the inaugural CCM/USA Hockey All-American Prospects Game on Sept. 29 at First Niagara Center in Buffalo. Among the 40 invitees are defenseman Seth Jones and forward Ryan Hartman, who were each invited to USA Hockey's National Junior Evaluation Camp in Lake Placid, N.Y., next week. 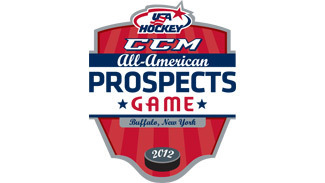 The players selected to compete in the game were chosen by USA Hockey in conjunction with NHL Central Scouting. Goalies: Hunter Miska, U17 NTDP, USHL; Eamon McAdam, Waterloo Black Hawks, USHL; Cal Petersen, Waterloo, USHL; Jared Rutledge, U18 NTP, USHL. Defense: Gage Ausmus, U17 NTDP, USHL; Will Butcher, U17 NTDP, USHL; Cody Corbett, Edmonton Oil Kings, WHL; Mike Downing, Dubuque Fighting Saints, USHL; Trevor Hamilton, U17 NTDP, USHL; Seth Jones, Portland Winterhawks, WHL; Clint Lewis, U17 NTDP, USHL; Ian McCoshen, Waterloo Black Hawks, USHL; Dakota Mermis, Green Bay Gamblers, USHL; Steve Santini, U17 NTDP, USHL; Scott Savage, U17 NTDP, USHL; Keaton Thompson, U17 NTDP, USHL. Forwards: Evan Allen, U17 NTDP, USHL; Justin Bailey, Kitchener Rangers, OHL; Taylor Cammarata, Waterloo Black Hawks, USHL; Cole Cassels, Oshawa Generals, OHL; J.T. Compher, U17 NTDP, USHL; Dawson Cook, U17 NTDP, USHL; Adam Erne, Quebec Remparts, QMJHL; Austin Farley, Fargo Force, USHL; Hudson Fasching, U17 NTDP, USHL; Ryan Fitzgerald, Malden (Mass.) Catholic High School; Ryan Hartman, U18 NTDP, USHL; Luke Johnson, Lincoln Stars, USHL; Tyler Kelleher, U17 NTDP, USHL; Matt Lane, U18 NTDP, USHL; Jimmy Lodge, Saginaw Spirit, OHL; Anthony Louis, U17 NTDP, USHL; Sean Malone, Nichols Schools (N.Y.); Mike McCarron, U17 NTDP, USHL; Jacob Montgomery, Shattuck-St. Mary's (Minn.); Tyler Motte, U17 NTDP, USHL; Ross Olsson, Williston Northampton School (Mass. ); Quentin Shore, U18 NTDP, USHL; Devin Tringale, Lawrence Academy (Mass. ); Frank Vatrano, U18 NTDP, USHL. All players participating in the event are eligible for the 2013 NHL Draft. There are 31 players from the United States Hockey League, including 22 from the National Team Development Program. There are six American-born players from the Canadian Hockey League, including defensemen Seth Jones of the Portland Winterhawks in the Western Hockey League and Cody Corbett of the WHL's Edmonton Oil Kings, and forwards Justin Bailey of the Ontario Hockey League's Kitchener Rangers, Cole Cassels of the OHL's Oshawa Generals, Jimmy Lodge of the OHL's Saginaw Spirit and Adam Erne of the Quebec Major Junior Hockey League's Quebec Remparts. The game will also feature five high school players, including forwards Ryan Fitzgerald of Malden Catholic (Mass. ), Sean Malone of Nichols School (N.Y.), Jacob Montgomery of Shattuck-St. Mary's (Minn.), Ross Olsson of Williston Northampton School (Mass.) and Devin Tringale of Lawrence Academy (Mass.). The USHL's Waterloo Black Hawks, who will participate in the 2012 Junior Club World Cup tournament Aug. 18-26 in Omsk, Russia, have four players on the roster. The list includes 2011-12 USHL Rookie of the year forward Taylor Cammarata and defenseman Ian McCoshen, who is regarded as an "A List" prospect by NHL Central Scouting to open the season. Both Waterloo goalies, Eamon McAdam and Cal Petersen, were chosen. "We're excited to participate in this new showcase for America's best young hockey players," USHL president and commissioner Skip Prince said. "We're also honored that more than 80 percent of these outstanding young prospects have direct ties to the USHL's 16 member clubs, including the NTDP. There is going to be great hockey played this fall in Buffalo." Jones, of Plano, Texas, is the son of former NBA forward and current New Jersey Nets assistant Ronald "Popeye" Jones. He'll continue his career with the Portland Winterhawks of the WHL in 2012-13. Jones had three assists in six games to help the U.S. win its third straight gold medal at the 2011 World Under-18 Championship in Germany. "If there's a defenseman better than him next season, I'm looking forward to seeing him," NHL Central Scouting's Chris Edwards told NHL.com. "He's a solid, big guy, who handles the puck very well. He's also very smart." Danton Cole, who coached Jones on the U-18 NTDP last season, agreed with Edwards. "It's very rare to find it so difficult to determine a hole in someone's game, but Seth is that type of player," Cole told NHL.com. "He's the kind of kid that if you show him once, he does it right once and won't do it wrong again. There's an amazing feel for the game of hockey within him, and he has that sixth sense where to go. He knows how to create space and, defensively, knows when to jump in and when not to go." In 46 games with the U-18 USNTDP last season, the 6-foot-3, 210-pound Jones had five goals and 23 points. "It's really hard to put a finger on one particular thing that he does so well, but his natural feel and instinct as an athlete just fit the game of hockey so well," Cole continued. "It's kind of like Lance Armstrong … God steered him toward being a bike racer and everything fit. Somehow, Seth ended up playing hockey, and it's been a perfect fit; he's a pleasure to coach." Also on the roster is 6-foot-3, 195-pound forward Justin Bailey, who helped lead the Long Island Royals to the Under-16 Tier I national championship in 2011-12. That team was coached by Hockey Hall of Famer Pat LaFontaine.